The idea for these is based on the Improv Challenge this month which is hosted by Frugal Antics of a Harried Homemaker. Each month there are two different items listed and we are challenged with creating a recipe with them. In a previous challenge I made this. 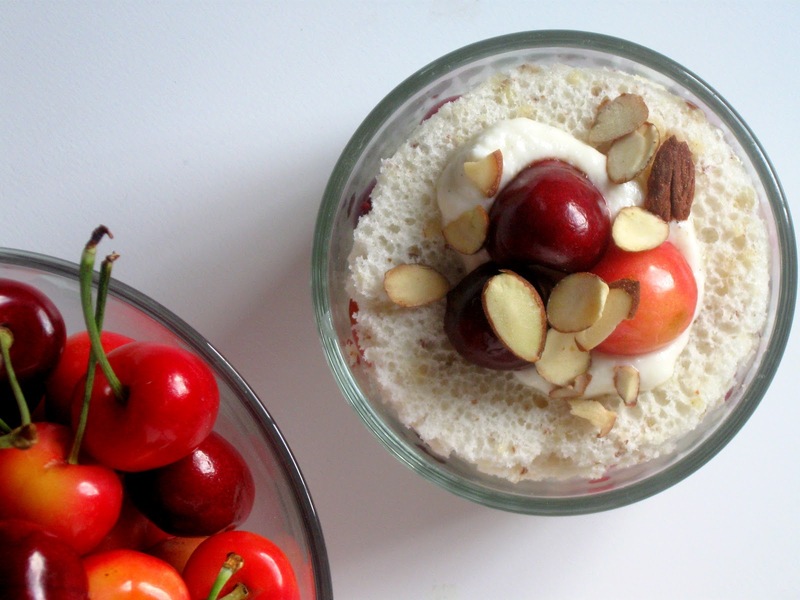 This month's challenge is to create a recipe made with almonds and cherries. I chose to use fresh cherries and sliced almonds to make these adorable trifles. I also used almond angel food cake, as I mentioned earlier and it added a nice flavor. You could use any soft of yogurt for these but I'm a big fan of non-fat plain Greek yogurt because it can be flavored or sweetened with anything. I used brown sugar but you could use honey or agave nectar if you wanted to. I also mixed in some vanilla bean paste because I love the speckles in a a dessert, and they add flavor of course :). The pan I used is this nonstick jelly roll pan from Williams-Sonoma, in case you were wondering who makes a 10" x 15" jelly roll pan. I'm sure you can find one that is similar in size to use, or you could always bake the cake in ungreased cupcake pans and it should turn out fine. I have successfully baked angel food cupcakes like these many times. I should probably mention that I like to toast almonds in my toaster oven on the "toast" setting but you could also toast them in a 325F oven for 5-7 minutes usually. The key is to watch them really close because you don't want them to burn. When you start to smell them then they are done or almost done. There is barely any brown color on the ones toasted but they still taste toasted and have a little golden color to them. As always, if you have any questions or thoughts please ask or let me know :). Happy Baking! 1. Preheat oven to 325F. In a food processor blend together the almonds and 1 tablespoon of granulated sugar until finely chopped. In another bowl, sift together the flour, powdered sugar, and salt. Stir the almond mixture into the flour mixture and set aside. 2. In a large mixer bowl beat the egg whites at high speed until they become foamy. Add in the cream of tartar and beat until soft peaks. Add the 6 tablespoons of granulated sugar, 1 tablespoon at a time, beating until soft peaks form. 3. Gently fold in ¼ of the flour mixture at a time into the egg whites. Fold in the almond extract. Fold until completely blended being sure to scrape the bottom of the bowl but do not overmix or the mixture could deflate. 4. Spread the mixture into an ungreased 10” x 15” jelly roll pan and smooth so it is even. Bake for 22-25 minutes or until the cake begins to come away from the edges and springs back when touched lightly. Cool completely. 5. In a small bowl mix together the yogurt, brown sugar, and vanilla until well blended. 6. Cut out circles in the cake with a cookie cutter according to the size of the dishes you are using. 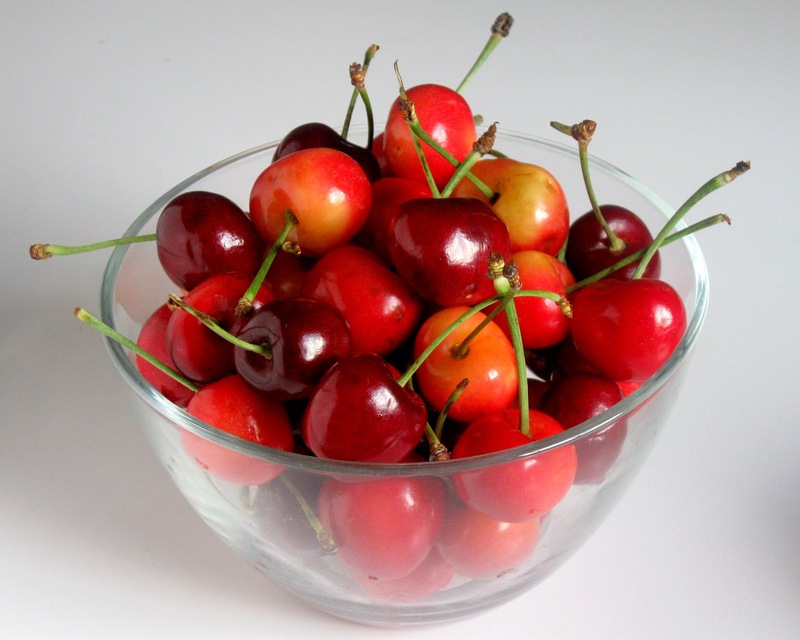 Layer the cake, yogurt mixture, and cherries in a bowl. Top with whipped cream (if desired) and toasted almonds. Serve. Your pictures are gorgeous and this sounds amazing! Mouth watering! They look delicious. Thanks :) They're really great for dessert during the hot summer. I love individual desserts, too. They are so much fun and it's harder to eat too much. Your trifles look lovely. I love individual desserts also, and this one looks so wonderful! Can't wait to try it! Thanks for stopping by, let me know if you try it. I would love to hear your thoughts! Oh, you are making me SO hungry! These trifles look amazing...perfect treat for a hot day! 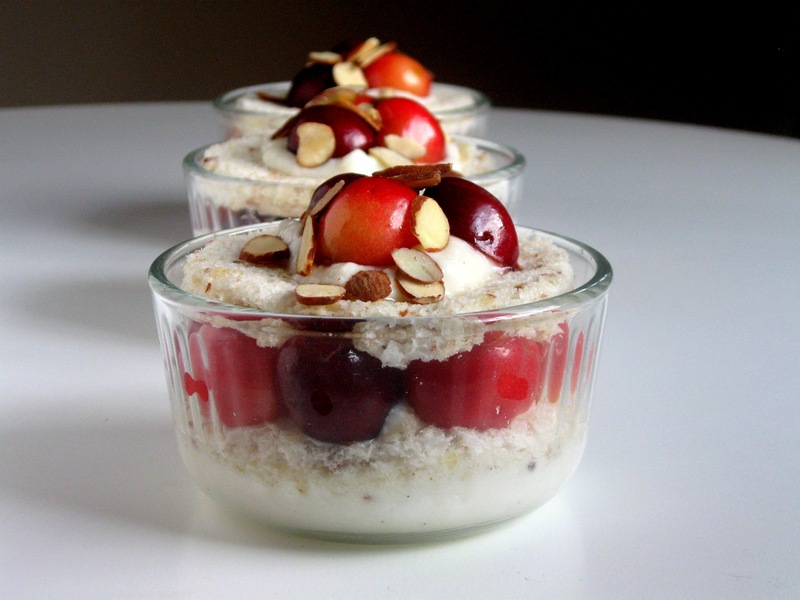 Love your individual trifles! What a beautiful dessert for the Improv Challenge! I love your take on the almond angel food cake. My family has angel food cake for every birthday... I might try to change it up next occasion using your idea to add almond flavour to the cake! 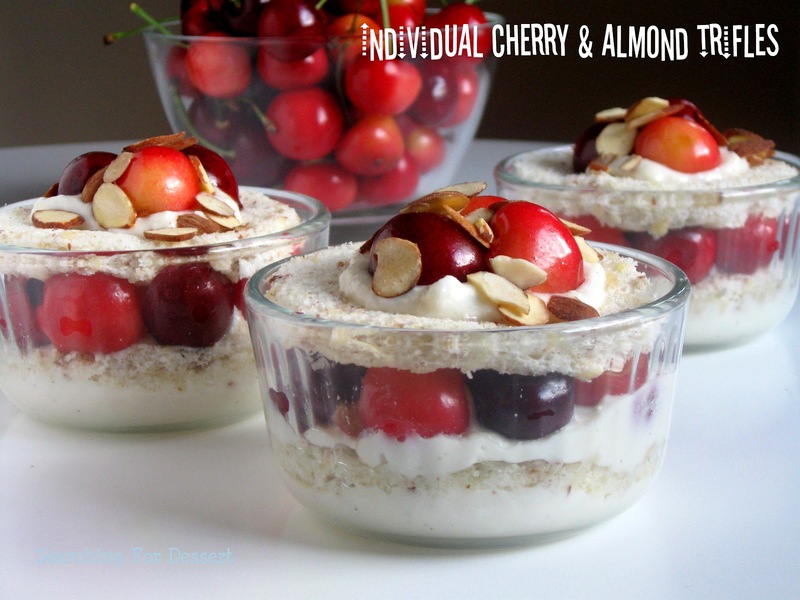 I love individual desserts, and these look great!! What adorable trifles! Great idea. What a great idea! Love these trifles!